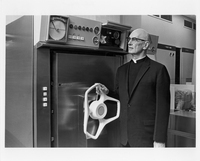 Father James F. Maguire, S.J. 1975 Sword of Loyola recipient, actor and comedian Bob Newhart with President James Maguire, S.J. .
Jim Henson, creator of the Muppets receives the Sword of Loyola from President James Maguire, S.J. and Mrs. Maude Clarke, 1982. Actress Helen Hayes recieves the Sword of Loyola from President James Maguire, S.J., 1971. 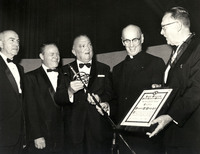 J. Edgar Hoover receives the first Sword of Loyola along with Dr. Francis J. Gerty, recipient of Stritch Medal. 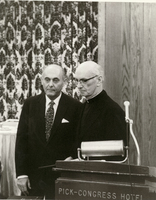 Sir Georg Solti, music director of the Chocago Symphony Orchestra was cited at the 1973 Founders' Day ceremony for his musical skills as a conductor and contributions to the CSO, with Father Maguire.